Happy Wednesday my good people! With the Holiday festivities quickly approaching, let’s talk bar carts… I absolutely love them and think that they add the perfect extra little detail to decor. But, I understand space restrictions, and while I would love to have a fancy bar cart, I opted for an alternative. My trusty bar tray. 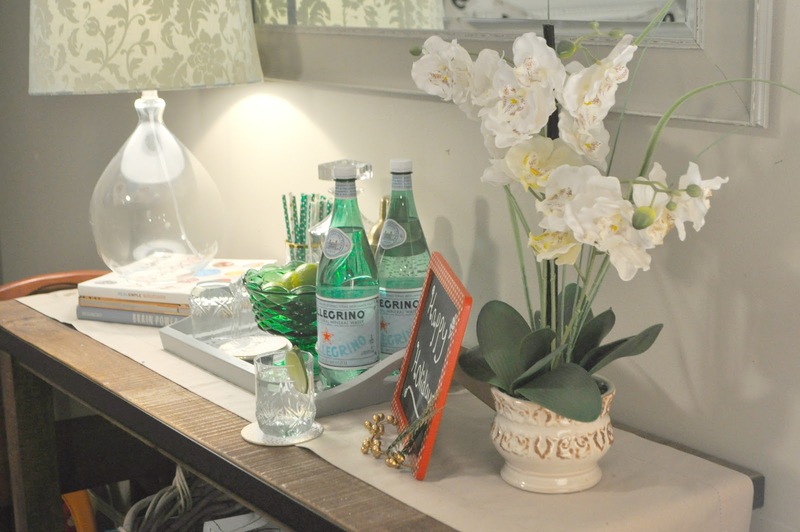 I just love how it fits perfectly on my console table in the family room. It’s easy to decorate and super functional for any family or friendly function. Not a drinker? These alternatives are awesome! How cute is the little cocoa station from Clean and Scentsible? Or how about this cute simple setup for a light drink during brunch. 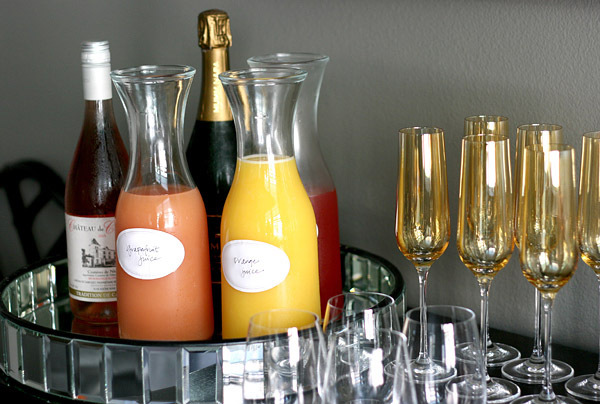 This Mimosa Bar is super cute! Having one in your home is very easy to create and space friendly, and you definitely won’t regret it. Why not create one for your friends/guests this Holiday season. They are sure to enjoy it! 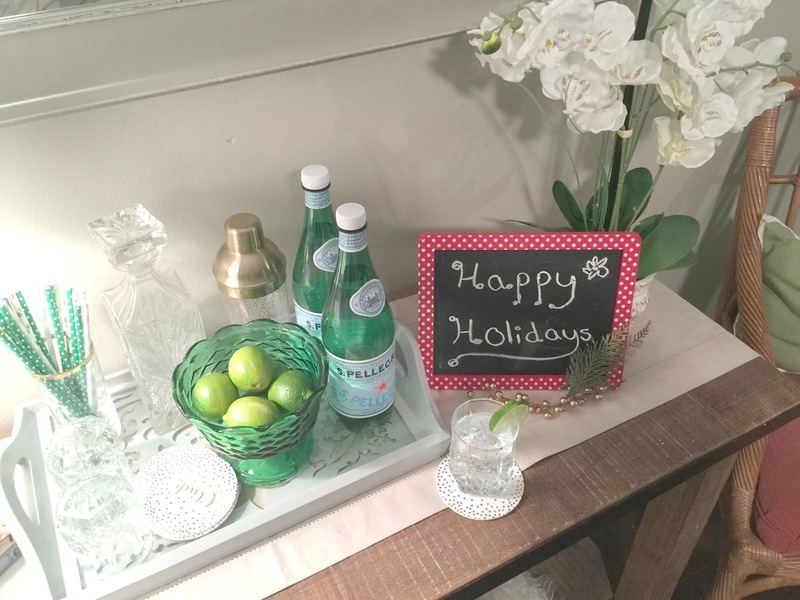 Here is what I suggest: grab a tray of your choice- either round or square, glasses from Dollar Tree (that’s where mine are from), add your favorite adult beverages or sparkling water, a few coasters (follow my tutorial here where you can DIY your own for under $4,) decorative straws from the Target $1 section, and wala– super simple. my decanter was a gift, and the gold drink mixer was found at Goodwill. You can also add some flowers to add a bit more styling. All in all, I would say that the bar tray is a great alternative for for use when space is limited, when a bar cart is not possible. Why not give a simple one a try for the upcoming Christmas or New Year Holiday! So what do you say? 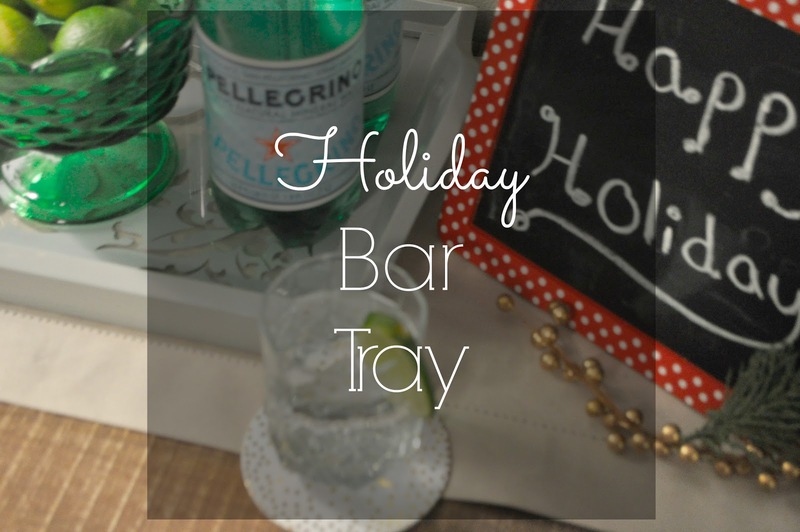 Will you be giving the bar tray a try? Or do you already have a bar tray? As always, thanks for stopping by…Have a VERY Merry Christmas, and if I don’t pop in before the New Year..Happy New Year! I think they are a great alternative to a cart for small spaces. Merry Christmas friend!! Gonna be a sweet one with little Jules at the age he is. I hope you had a fantastic Christmas Lauren! And have a wonderful New year! Love your holiday tray! 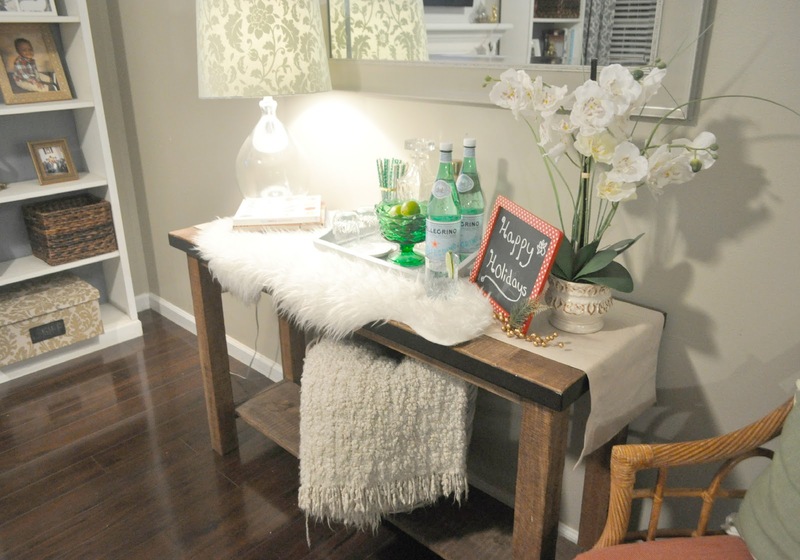 I have a bar cart but I still may incorporate a bar tray in my home. Great ideas! Thanks so much! Bar trays are nice to have. I actually have a bar car but I use it as a side table in my living room. 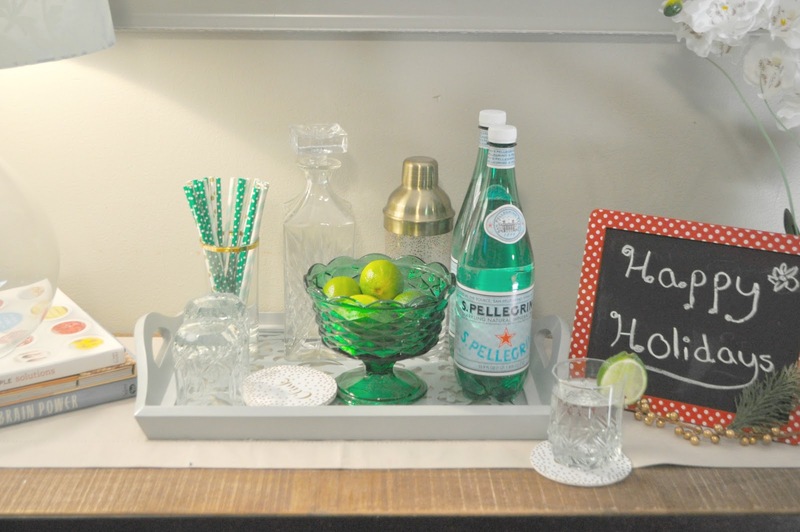 Love your bar tray, it's a great idea for fellow small home owners such as myself! 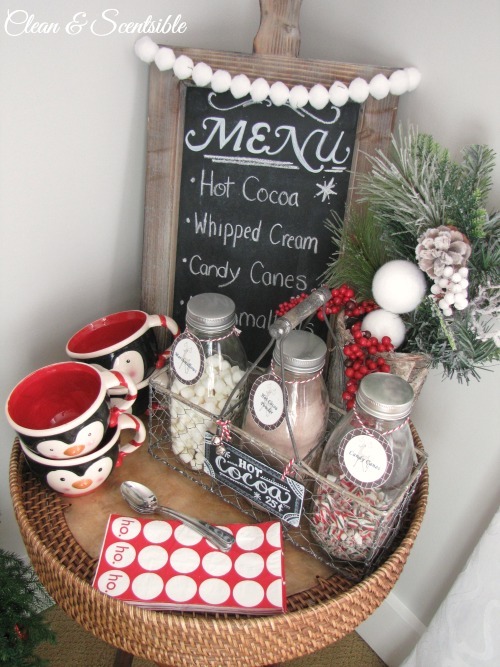 That hot chocolate bar is just too cute!